The third mattress series listed by Eclipse International (also called Eclipse Sleep Products - ESP) is the Contour Care Collection. These are heavy duty innerspring mattresses with Bonnell coils. The other two series, Perfection Rest Collection and Conformatic Collection, have offset coils and pocket coils respectively. This series has the only two-sided mattress listed by Eclipse on its website, the Windsor. This feature increases the expected lifetime of the mattress. The other three listed models, Ultimate, Gladstone and Elegance, are all one-sided. Each model is available as either firm or plush, though judging by the descriptions these are broad classifications. The Bonnell springs are described as "heavy gauge" for each of the Contour Care mattresses. The coil counts vary by model: 572 in Windsor, 540 in Ultimate, and 416 in Gladstone and Elegance. Each innerspring has two perimeter rods, one each around the top and the bottom. These spring units also have the Spinal Zone feature, with a second perimeter rod over the center section of coils for more support where most of the body weight is. Though not stated, the coils in the middle could be firmer. 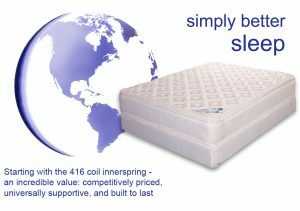 The innerspring is foam encased, which is unusual for Bonnell coil mattresses, However, this is part of the edge support. This foam encasement is enhanced by LifeEdge Butterfly Support Technology, the insertion of butterfly-shaped wire springs (see illustration above) into the foam rails. There is an insulator pad of pre-compressed polyester and cotton fibers atop each innerspring. This keeps the coils and the foams from interferring with each other. For Windsor, the two-sided model, this means an insulator on each side. What comes next depends on the model. For Windsor and Ultimate, this is firm Eclipse upholstery foam. All Contour Care Collection mattresses except the Gladstone have 3" pillow tops. Each pillow top has ultra plush Eclipse comfort foam. Windsor and Ultimate each add a layer of memory foam to the pillow top. The firmness of this foam is not given. The memory foam adds conformity and pressure relief to the mattress, cushioning the firmness of the coils. Gladstone, which does not have a pillow top, also does not have upholstery foam. It has two comfort layers, firm comfort foam topped by memory foam . The covers of mattresses in the Contour Care Collection are quilted to a flame resistant (FR) layer and quilting foam. The composition of the FR is not named, but it could be compressed wool or rayon infused with silica. The quilting foam is high density in Windsor and Gladstone, plush in Ultimate, and ultra plush in Elegance. The cover fabric could be a damask of organic cotton, since this is one of the advanced features for select models. For heavy gauge Bonnell coil mattresses, such as these, adjustable beds are not suitable. The mattress is not flexible enough, and it may damage the coils. A box spring is the best foundation, since it acts like a shock absorber. This can be a traditional coil type or the newer advanced design, such as Leggett & Platt's Semi-Flex. Contour Care mattresses are available through participating retailers. The Eclipse website has a store locator page. Depending on the model, Eclipse International covers one of these mattresses with either a 5 or 10 year limited manufacturers warranty.